I found Nemo and Dory but they could not tell me where is Anchor. So I launched 3 expeditions to find the elusive Anchor. The adventure finally led to a deep dive into the pristine Swallow Reef or locally known as Pulau Layang-layang waters. Finally found Anchor! 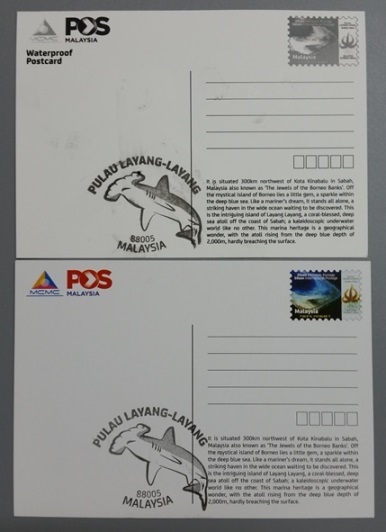 The adventure started since last year on 07 August 2015 when the post box and a postcode was launched for Pulau Layang-layang. However, hardly a month later, the postbox was closed for 6 months from September 2015 to February 2016 due to the weather condition. The weather affected all activities on Pulau Layang-layang. A special cachet with the image of a hammerhead shark (yes Anchor from Finding Nemo!) is made available for mails sent via the underwater postbox. Logistically this is the hardest to reach postbox! Imagine flying to Kota Kinabalu followed by a special flight by MASwings to the island. There are only 3 private charter flights a week (Tuesday, Friday and Sunday). Then a dive (if you are really into this) to the postbox. The postbox is 40 metres below sea level making it the deepest thus far. However this has not been verified by the Guinness World Records (the next closest is only 10 metres below sea level in Japan). A postal agent is appointed on the island with 2 underwater postmen to collect the mail. The mail is then returned to Kota Kinabalu via MASwings to the Mail Processing Centre in Kota Kinabalu where the mail is processed as normal. 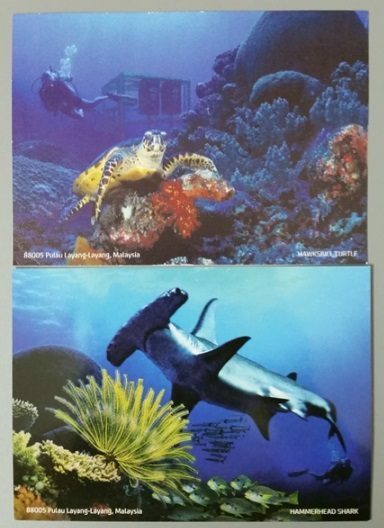 The postal agent issued 4 types of postcards featuring the marine life around the reef. These are the Pos Malaysia versions which has long been sold out. The top postcard is a special waterproof postcard. It is extremely thin. The surface adhesion to ink is quite poor due to the waterproofness. 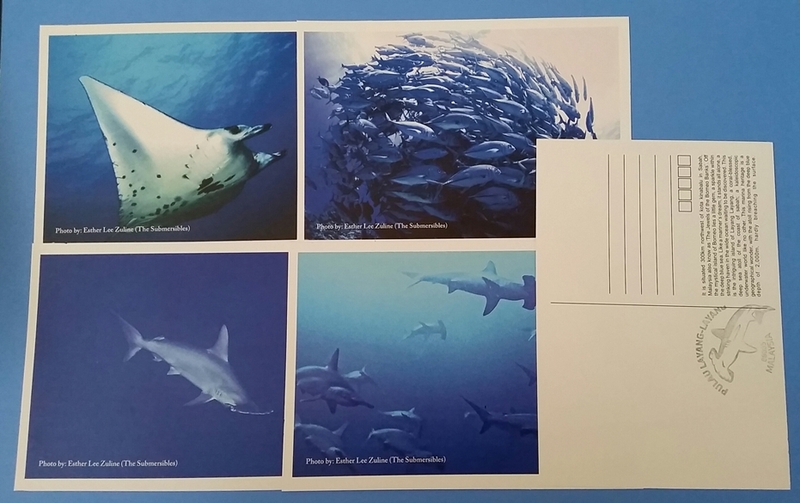 The bottom postcard is a regular postcard. This postbox one of the 3 (as of the date of writing) special postboxes with special cachet launched by Pos Malaysia. It is actually the second special postbox with special cachet but the hardest to reach. Did you know that this is NOT the second special postbox? The second special postbox does not have a special cachet. Do you know where is it? Hint…take a dive.